"Without law and order our nation cannot survive." It should be much more apparent to European diplomats today, that the relative leniency with which the European Union is approaching the Erdogan government's sins against democracy and human rights, is being used to the advantage of the ruling Justice and Development Party, or AKP. We have been trying for weeks to warn that selective criticisms leveled at Turkey by EU officials are disheartening pro-EU elements in Turkey. For example, the same officials who made negative remarks against the AKP over the closure case, have not been vocal in the face of some highly telling, and to that extent worrying, salvos from government quarters. However [AKP's] "sins against the Copenhagen Criteria" are increasing, yet no one, other than European deputy Joost Lagendijk that is, appear to have much to say on this front. Just a look at the government's recent record should send shivers up European spines. Especially among those who invested so much hope in this government. * Prime Minister Erdogan calls for media boycotts because of the way it reported the Deniz Feneri corruption case in Germany, an extension of which clearly existed in Turkey and involved quarters very close to the AKP. * Prime Minister Erdogan justified the use of sawed-off shotguns by individuals against pro-Kurdish demonstrators, saying citizens have the right to protect themselves. The fact that he is inciting armed violence does not appear to concern him much. * Prime Minister Erdogan started to play the ultra-nationalist and told pro-Kurdish politicians to either respect the flag and nation or leave the country. He conveniently forgot there were times his party had been attacked for being "Islamist" by opponents who said, "Either respect secularism or go to Saudi Arabia." * In the same vein, AKP Yozgat deputy Abdulkadir Akgul while arguing with pro-Kurdish deputy Hasip Kaplan in Parliament, went as far as saying, "I would of course take pleasure in shooting those who are against their own state and nation." * State Minister Nimet Cubukcu is more concerned with slinging mud at Sarah Ferguson and the ITN network for exposing abuse in centers for disabled children in Turkey, than explaining what she intends to do to bring these centers up to EU standards. Having been caught out two years ago in a similar incident in Malatya, exposed by the Turkish media on that occasion, she clearly has done little in the meantime to improve standards in these centers. * Defense Minister Vecdi Gonul came out with remarks justifying what amounts to ethnic cleansing by saying that if Greeks and Armenians remained in Anatolia, Turkey would not be a national state today. He totally disregarded the pain and suffering of Greek, Armenian and Turks alike in the past, and left open the question of his opinion on the Kurdish problem in this country, relative to his despicable views. * The government continues to be reluctant to act in the face of mounting police brutality, torture, and abuse of women, which continues unabated, with impunity, and remains committed to the tradition of protecting those guilty of the crimes. When it does act, on the other hand, it does not do so on its own initiative, but because the issue has caused a major public outcry. * The Prime Ministry tries to ban "undesirable reporters" from covering Prime Minister Erdogan by canceling their accreditation, even though it can not accuse the banned reporters of writing untruths or of fabrication. The government followed the lead of the General Staff in this respect, showing once again how much of a defender of the traditional status quo it has become. The bottom line here is that Mr. Erdogan wants "AKP friendly news" and loses control, both verbally and otherwise, when he does not get it. The whole idea behind the EU perspective is positive change under the umbrella of lofty ideals, which include human rights and press freedom. If this does not happen, then the EU will start to lose its meaning, even for Turks who have supported this perspective strongly hitherto. 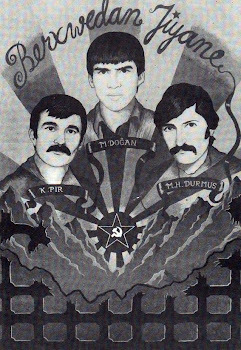 * The acquittal of the murderers of Uğur and Ahmet Kaymaz. * The cover-up of the Şemdinli bombing. * The Ankara regime's use of chemical weapons against the Kurdish freedom movement. * The Amed Serhildan, when Katil Erdoğan sanctioned the murder of women and children. * The refusal of HPG's ceasefire. * Attempts to repress DTP and Kurdish voters prior to and during the elections. * Imposition of new OHAL zones and increased human rights violations in them. * Murder of a Kurdish infant for supporting PKK. * Newroz and police torture of children on city streets. * The murder of Hrant Dink. * Öcalan's poisoning and torture. I could go on and on and on . . . But I certainly won't hold my breath waiting for the Europeans to develop a conscience. Sad that so many of my Kurdish brothers chose to vote for the AKP just because they and the AKP follow the same foreign religion. Well, I knew they were bad from the start. I've been saying it for years. History has shown us the same lesson time and again: they'll make all manner of campaign promises, but once Islamists gain power they only serve themselves. Well, Resa, there's another election coming so now is not the time to forget the crimes of AKP. Now is the time to push these crimes more and more. Never let anyone forget. Keep reminding. Keep stoking the fire.